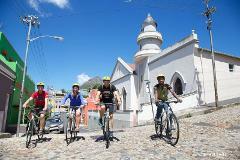 Spend three hours exploring the gardens and streets of Cape Town on a professionally guided city cycle tours. Scheduled tours depart from outside the Information Centre at the V&A Waterfront on a daily basis at 10am and last for 3 hours. 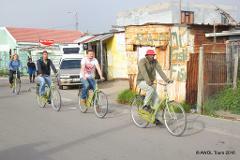 Guests join scheduled cycle tour in Masiphumelele Township with a local qualified guide visiting interesting places and explaining Xhosa customs. A highlight of the tour is traditional dancing by the Sangoma and a visit to a preschool. 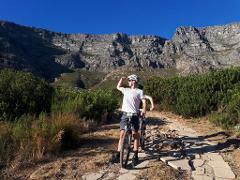 Experience the thrill of riding single track on the slopes of Table Mountain on our half day mountain biking tours in Cape Town including transfers from hotel . 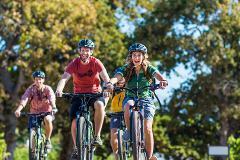 Or upgrade to a full day out in Elgin, Stellenbosch or Wellington. 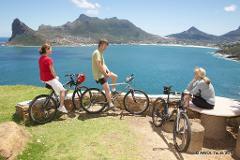 Feel the exhilaration of exploring the Cape Peninsula on two wheels. Cycle or hike through unique landscape to the Cape of Good Hope.